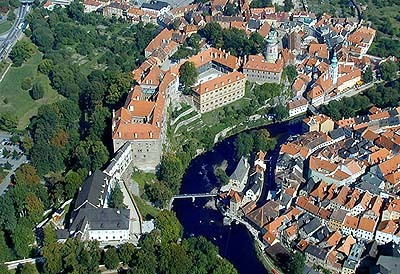 The castle complex in Český Krumlov is accessible from the east from Latrán street through the Red Gate leading into the Ist Courtyard of Český Krumlov Castle, called Rejdiště (Romping ground). To the left of the Red Gate is the building of the former Pharmacy (Castle No. 46 - New Pharmacy which passes into the former stables - todays\' Český Krumlov Study Centre (Castle No. 232 - Stables) and Old Burgrave\'s House (Castle No. 58 - Old Burgrave\'s House), where the highest official and administrator had his office. To the right of the Red Gate, there is the former Salt-house (Castle No. 57 - Salt-house) - an original Gothic salt storage. From here the buildings continue to the original Old Pharmacy (Castle No. 66 - Old Pharmacy), cold storage and smithy. The building of the former dominion Brewery (Castle No. 65 - Brewery). creates one of the main buildings of the right courtyard side. Later on, there was a princely cheese-diary. Next to it stands the building of the former Hospital (Castle No. 184 - Hospital) and at the very end of the Ist courtyard there is a small house, where the court gunmaker lived (Castle No. 64). The large coach-house from the 18th century, which remained in its original extent, covers the opposite side. In the middle of the courtyard there is a small park planted with aged trees, its centre dominated by a stone fountain dated from the 16th century (Fountain in the Ist Courtyard of Český Krumlov Castle). The tour of the castle continues across a stone bridge built in the place of a former wooden drawbridge. It is decorated with the sculptures of Virgin Mary and St. Joseph. The bridge extends over the castle moat where bears have been bred as far back as the 16th century (Bear Moat at Český Krumlov Castle). The passage lined with stone slabs with the Schwarzenberg coat of arms on the top leads into the IInd Courtyard of Český Krumlov Castle, the area of the so-called Lower Castle. The courtyard is dominated by the living palace with a tower called the "Little Castle" (Castle No. 59 - Little Castle) which is the oldest part of the entire castle complex. The Gothic castle tower (Castle No. 59 - Castle Tower) dating from the second half of the 13th century was remodelled in Renaissance style in 1591. The building of the New Burgrave\'s House (Castle No. 59 - New Burgrave\'s House), nowadays housing an extensive castle library (Castle Library in Český Krumlov). is situated on the northern side of the courtyard. The northern wing of the New Burgrave\'s House is the accommodating headquarters of the State District Archive Třeboň, Branch Český Krumlov. Next to it stands the original staircase tower - Dairy (Castle No. 59 - Dairy), in which butter was processed. The southern side of the IInd courtyard is created by the building of former Mint (Castle No. 59 - Mint). The castle fountain (Fountain in the IInd courtyard of Český Krumlov Castle), another work of stone, enlivens the centre of the IInd castle courtyard. Through the steeply rising corridor dated from 1574 - 1575 (Corridor Connecting the IInd and IIIrd Courtyards of Český Krumlov Castle) connecting the IInd and IIIrd Courtyards of Český Krumlov Castle leads to the Upper Castle (Castle No. 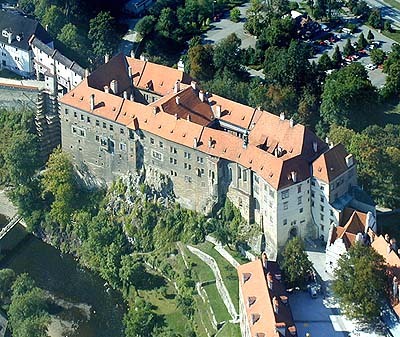 59 - Upper Castle) which is created by the complex of a single building situated around the IIIrd and IVth Courtyards of Český Krumlov Castle. Renaissance paintings depicting mythological scenes of Greek and Roman history decorating the facades of both courtyards are the work of Renaissance court painter Gabriel de Blonde. Interiors of this part of the castle are open to visitors in two guided tours. From here our tour leads into the passage behind the IVth Courtyard of Český Krumlov Castle through the entrance into the labyrinth of Wenceslas\' cellars (Cellars in the IVth Courtyard of Český Krumlov Castle) which are partly open as an exposition of the Czech Ceramic Design Agency. 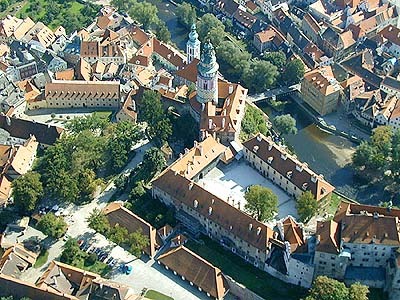 The Vth Courtyard of Český Krumlov Castle is accessible across the several-storey Cloak Bridge. Here stands a building of the Castle theatre which is the most completely preserved Baroque stage in the world. The tour passes along the Renaissance House (Castle No. 177 - the so-called Renaissance House), turns right up the hill towards the winter Castle Riding Hall (Castle No. 178 - Castle Riding School) or ascends directly to the entrance in the Castle Park. 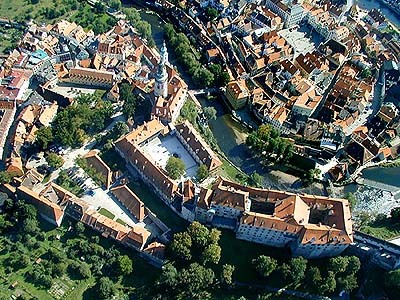 The Castle Gardens in Český Krumlov is rectangular shaped with dimensions 750 x 150 metres and is situated on a rise of three different levels. The Cascade Fountain, decorated with sculptures that represent the water Deities of water and allegory of the four seasons, dominates the park. In the middle stands a delightful Rococo Summer Manor Bellarie. Opposite the Summer Manor there is the structure of so-called Revolving Auditorium, and natural stage. The tour passes in a lengthwise direction by the wooden bandstand towards the end of the park where a small picturesque lake is located.